TORONTO, ON – Kensington Brewing has announced the release of a new limited edition draught-only beer – so limited, in fact, that the full batch has already been snapped up by craft beer bars in Toronto and Southern Ontario. Black Market is a 7% abv and 60 IBU black IPA brewed by Kensington brewmaster Dave Lee using the facilities at Grand River Brewing in Cambridge. Made with a selection of hops including Magnum, Cascade and Simcoe, the 20 hectolitre batch was dry hopped twice, creating an aromatic, hop-forward ale. 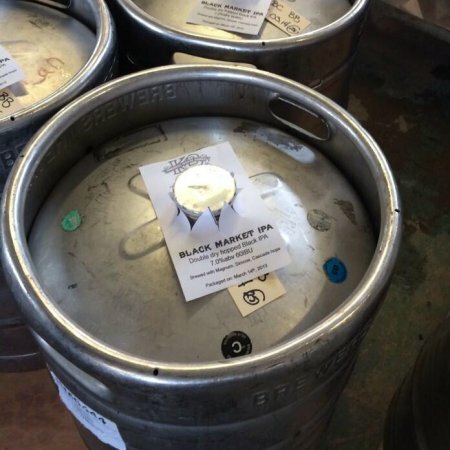 Kensington Black Market is on tap now or soon at select Toronto pubs including barVolo, Wvrst, Tequila Bookworm, Thirsty and Miserable, The Only, The Wren and more, and out of town spots including Pub Milos (London), Baker St. Station (Guelph), Imbibe (Kitchener) and the Woolwich Arrow (Guelph). It will also be available on cask at Victory Cafe and Bar Hop in Toronto.